Attachments are an integral part of email messages which allows users to share information in more well organized format. While sending attachments, it is necessary that the whole data is intact and there are no format changes. Below are some guidelines on attachments to follow. These guidelines for Outlook 2007 users and may vary in other versions of Outlook. Are you wondering how to attach a file with a corresponding email message? follow the steps here. An alternate straight option is also available. Go to the Navigation panel and select 'new mail message' option. A new window 'untitled message' will open, press the tab 'attach file' from here. Note- In Insert File, make sure 'All Files' option is selected else you cannot able to see all tylpes of file extension. In the HTML message format, in the 'Attached' column the attachments are displayed. There is no size limitation from Outlook, but it can be imposed by the Internet Service Provider (ISP). The size of an email is calculated consider the body message along with attachments. If the attached file size is large, ZIP program is suggested to compress the message. COM Add-in is a tool that is used to deal with ZIP file issues. How to install or uninstall COM add-in? In the COM Add-ins window, choose the appropriate add-ins and select or remove buttons. 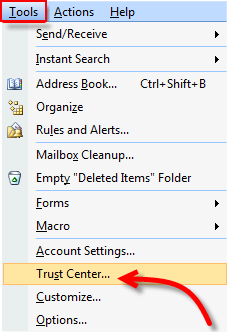 In Outlook 2013, there is an exclusive feature has been added to keep users alert if there is no attachment embedded in an email. The feature is helping users to send emails in an appropriate manner. The flexibility to add any size attachments to an email is offered by MS Outlook. It allows users to send an email in a well professional manner. Now, it is all up to you to use the application smartly.